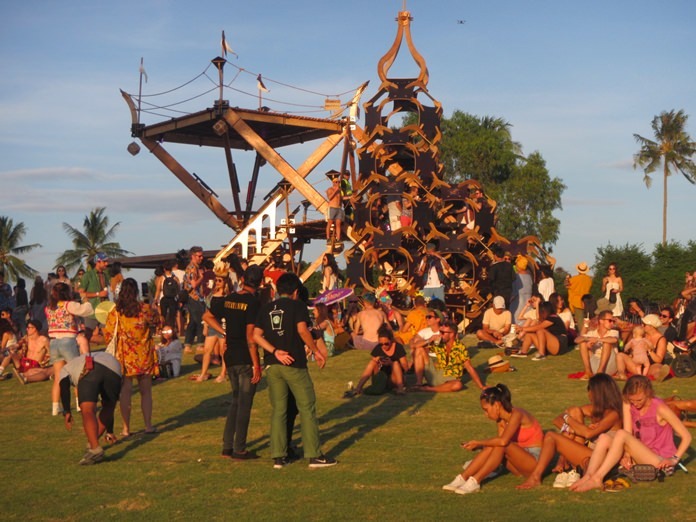 Wonderfruit combined elements of Woodstock and Burning Man festivals to bring a whole new experience to Pattaya. 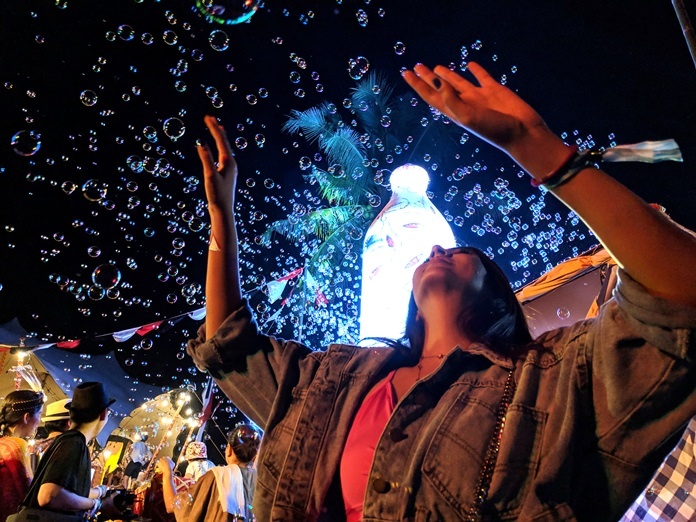 The annual Wonderfruit festival was created in 2014 by co-founders Pranithan “Pete” Phornprapha and Thai musician Montonn “Jay” Jira in an effort to bring a holistic festival experience to Pattaya and Thailand, with the emphasis being on arts, music, health & wellness and awareness of the environment. The first years saw a very limited attendance as advertising was only by word of mouth via the artists booked to attend, but by 2017 the numbers had swollen from a few hundred to approximately 11,000. The Tourism Authority of Thailand (TAT) set up a pavilion at the festival. The 5th annual eco-friendly Wonderfruit celebration of arts and music took place at Siam Country Club from December 13-18, 2018 and attracted a crowd estimated to be as high as 17,000. It was a trip back to the 60’s as seen by this reporters eyes; people wore their best tie dyed t-shirts (if they wore shirts), bib coveralls and floppy hats for the men, harem pants or less for the ladies, and of course a hipster attitude to complete the ensemble. This event was not attended by your average local, rather it was experienced by environmentally friendly hipsters from all over the world who are fortunate enough to be able to travel and take in events such as this that are held in various countries during the year. 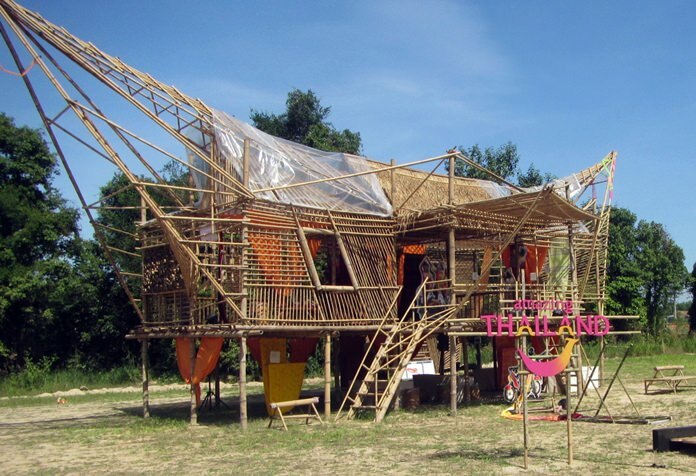 Much of the fabricated buildings in fact came from the recent Burning Man festival held in the Black Rock Desert of Nevada, and by Monday afternoon workers were in the process of dismantling the structures to be flown to Taipei for the New Years Eve celebrations, which will be much along the same lines as the one held here. At the main entrance a Thai Pavilion was located, where some general information and history of the kingdom was on show, while bicycles were available for rent as the vast festival area was hard to cover on foot. 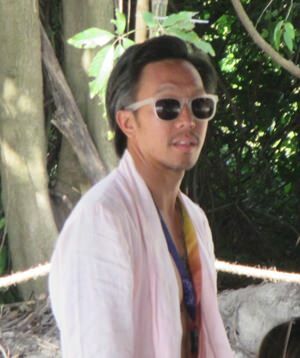 Wonderfuit co-founder Pranithan “Pete” Phornprapha. There were swimming holes at which the young children were taught paddle boarding, yoga tents, meditation and massage tents, several restaurants featuring street food as well as an area that showcased Thai cuisine by some of the nation’s top chefs. Also present was Mark Lloyd who holds two Guinness Book of World Records awards and he introduced a zero-waste bar as well as showing the crowds how to make cocktails from food scraps. Along with the list of notable celebrity cooks were a slew of western food stalls including the famous ‘Up To You’ food truck run by local entrepreneur Ae and Eddie Behr, as well as a host of other F&B venues with everything from pizza to ice cream. Music was available everywhere and it was a real interesting mix of culture, music, style and attitude. 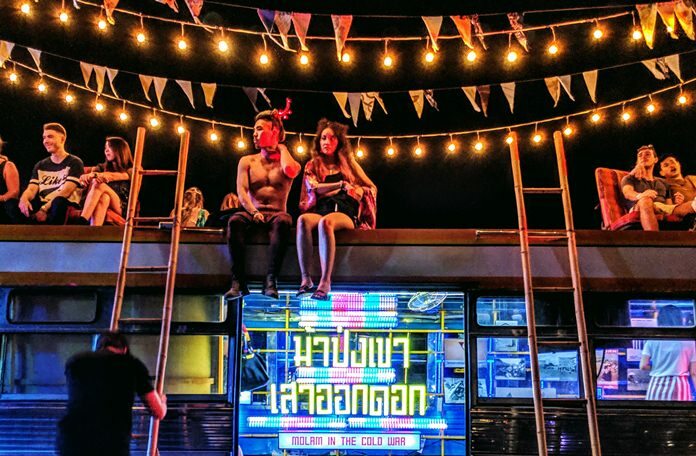 Is this the future for festivals in Thailand? I think it’s a good start, beginning with environmental awareness and alternative music. In an hour I walked past a full-on reggae band, an Indian-disco DJ, a sci-fi mood band, a jazz chill zone, a Thai Grateful Dead tribute band, and a super chill DJ in a giant Tuk Tuk. Jazz, Underground House and Soul music were all available, but Reggae seemed to be most people’s popular choice. The 24-hour non-stop Techno and electronic DJ music meanwhile enticed people to dance at all hours of the day and night. There were several stages set up for live music and as the weekend was drawing to a close the throngs in attendance were urged to gravitate towards the main stage where at 20:45 the music stopped and Sean Rogg from the Waldorf Project took over the microphone to initiate the ‘World’s Largest Experiment In Empathy Engineering’. Everything was going so well, I mean real groovy until the electricity was turned off and a voice announced that some “amazing experience” was to be had at the main stage provided by Waldorf! Hoping it would be a salad I ventured over in the darkness, and people were stumbling and falling down because they couldn’t see. Then a drone was sent upwards, hovering over the audience. At this point people dressed in black started lining everybody in long lines facing each other. They were being quite forceful about it and it was at this stage I decided I had had enough. I wasn’t going to sit in a dark field at night just because some volunteer black shirt told me I had to. This is Thailand and all sorts of critters live in those fields, and it’s the ones that come out at night I’m not too eager to meet! As I wandered back to the Ziggurat Stage, I noticed that several hundred other people had formed the same idea. Better to watch from afar than to be sitting like a target. The omnipresent voice kept promising the experience of a lifetime but it soon became all too clear that nobody understood what this experience was, and by the way, who is Waldorf? After another 20 minutes of nothing, hordes were fleeing the scene and it became more apparent that the great experiment was a total flop. 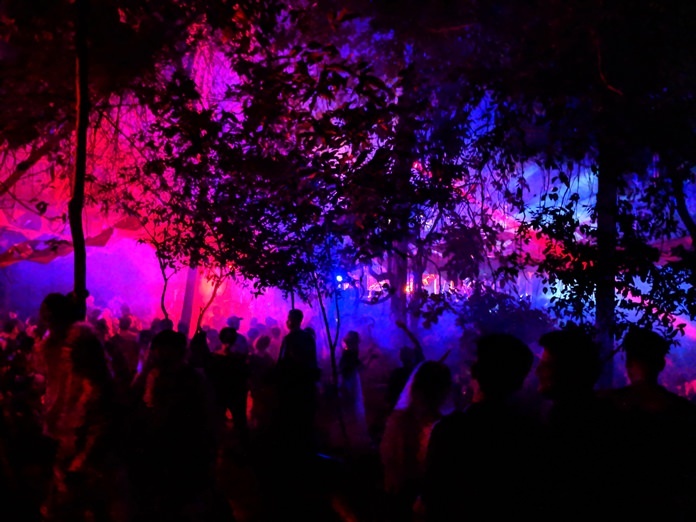 People started flooding towards the gates, thinking this was the end, and at that point somebody turned the electric back on and thankfully the remaining DJ’s and bands went into action once again and kept things grooving until the early hours of Monday morning. 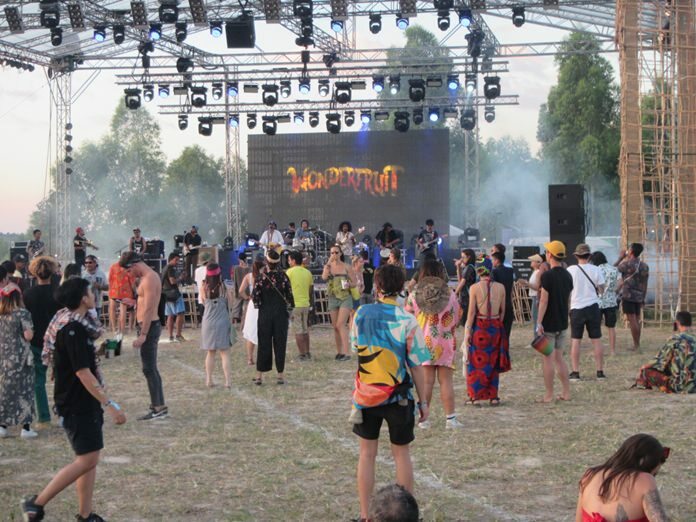 Smoke drifts across the stage as festival goers enjoy live music at the 5th Wonderfruit Festival in Pattaya. Despite the ‘Waldorf’ let-down, the festival as a whole was really quite an experience, and being so close to Pattaya it is an event not to be missed. It’s a thrill for all ages and nationalities, if not for the sheer cosmopolitism of seeing live bands and flaming baton twirlers, tasting excellent food, seeing the hippies and the hipsters, but also an occasion to raise awareness of our impact on the environment and how we can lessen our carbon footprint. I highly recommend it to everyone to pay a visit next year, and don’t forget to wear some flowers in your hair, just not plastic ones!